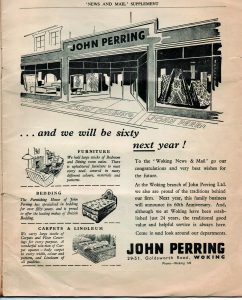 BACK in October 1954 the Woking News & Mail published a supplement to celebrate its diamond jubilee, charting some of the town’s history, details of it at that time and looking forward to what the future was thought to be. The staple-bound 20-page booklet makes interesting reading over 63 years later as it notes that the Woking News was first published by a Mr Moore on October 19, 1894, at 52 Chertsey Road. It was a development of a monthly news magazine “with a gratuitous circulation of 1,000 copies”.